After our museums and Clock Tower visit, Jandy, Cheska and I moved on to the Victoria Harbor waterfront for the Avenue of the Stars, one of Hong Kong’s newest attractions. 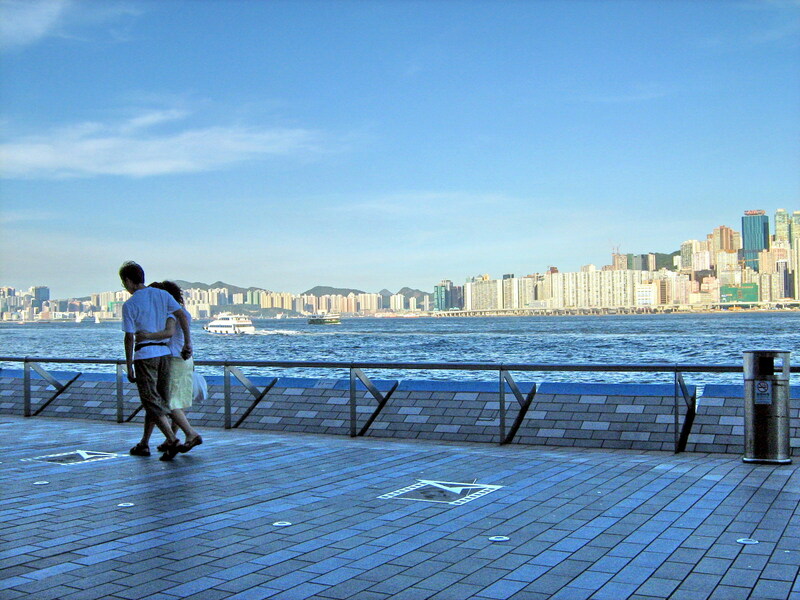 Opened on April 27, 2004, this HK$40 million avenue, built along an existing promenade, was designed by local architects AGC Design, financed by New World Group and supported by government bodies including the Hong Kong Tourism Board, the Hong Kong Tourism Commission and the Hong Kong Film Awards Association. Upon completion, it was donated to the Hong Kong SAR Government by New World Group. Modeled after the popular Hollywood Walk of Fame in the U.S., it honors glamorous celebrities of the Hong Kong (touted as the “Hollywood of the Orient”) film industry. Upon entering Salibury Garden (the western entrance), from the Hong Kong Museum of Art, we were greeted by a 4.5 m. high replica of the statuette given to winners at the annual Hong Kong Film Awards. Along its 440 m. long promenade, which commands a stunning panoramic view across Victoria Harbor, the story of Hong Kong’s 100 years of cinematic history is told through inscriptions printed on 9 red pillars. 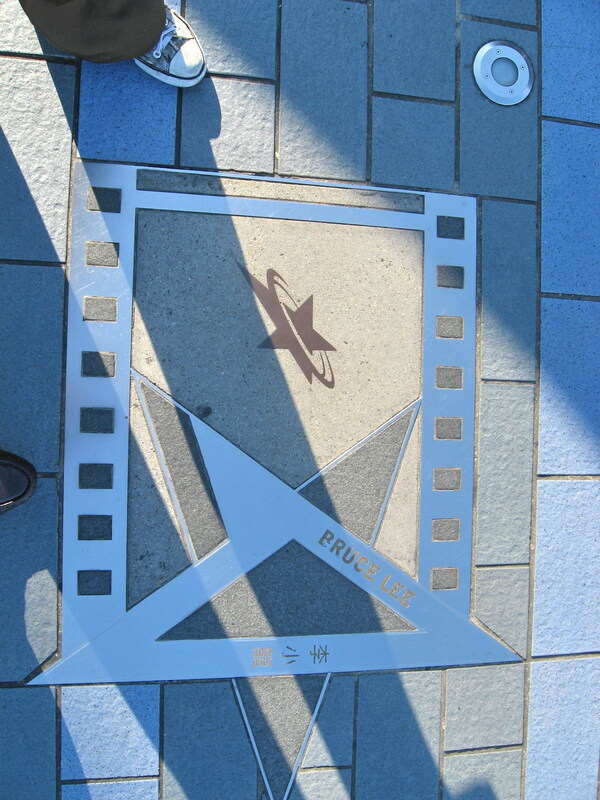 Also set into the promenade’s colored paving blocks are 101 (up from the initial 73) plaques honoring the celebrities, some emblazoned with hand prints and autographs of the stars set in cement, but most only contain the celebrities’ names as they are now deceased (such as Bruce Lee). 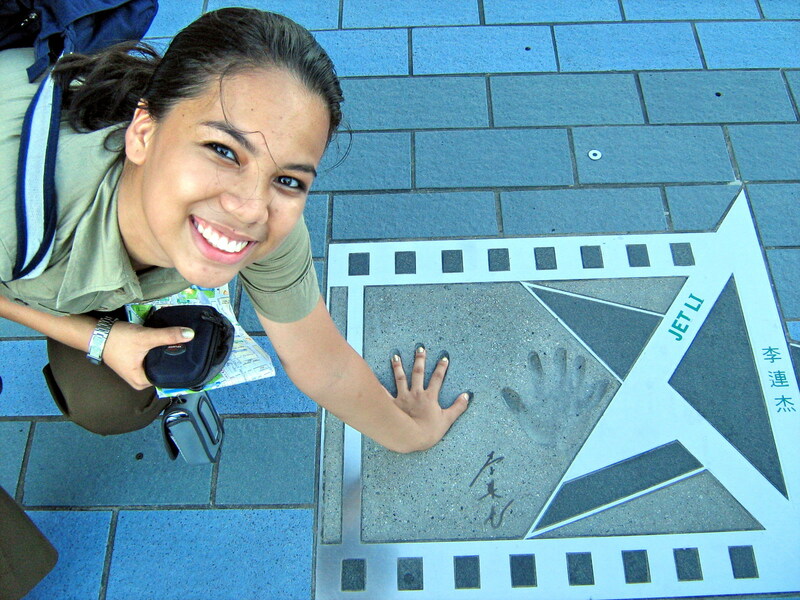 Among the few plaques with hand prints that we recognized were those of Chow Yun Fat and martial arts superstars Michelle Yeoh, Jackie Chan and Jet Li. We all can’t help but crouch or sit down and take photos of our hands in the molds of their hand prints. The others are recognizable only to the Hong Kong community or aficionados of Hong Kong films. 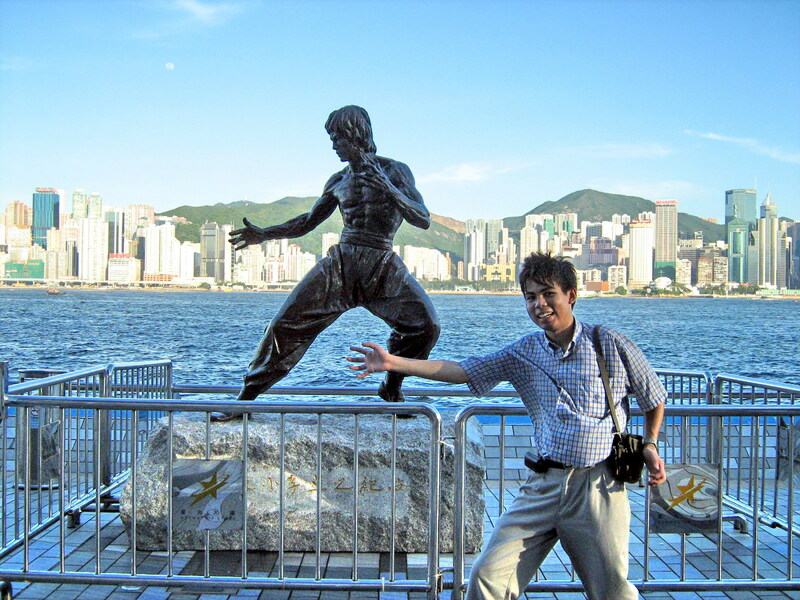 One of the most recent additions to the Avenue of Stars is the 2.5 m. bronze statue of the late Bruce Lee (1940-1973), erected here in 2005 to commemorate his 65th birth anniversary. 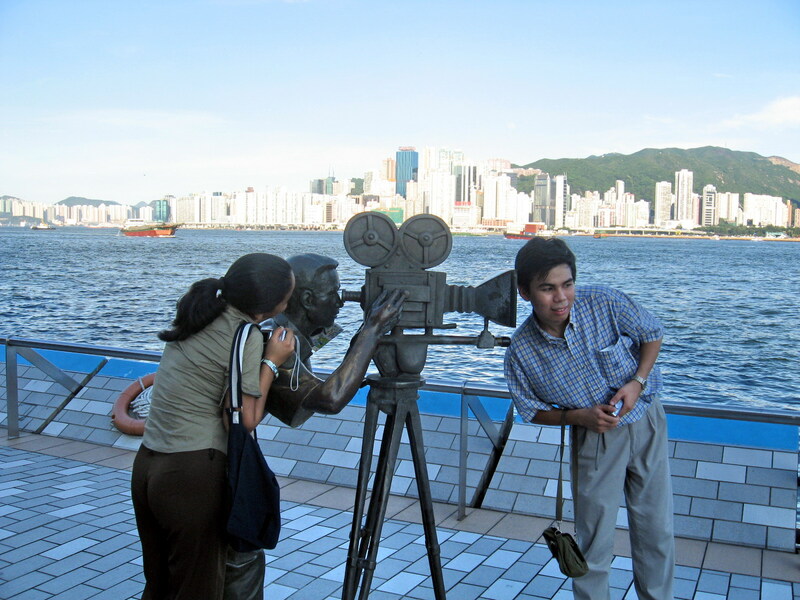 Another popular attraction along the avenue for photo opportunities is a statue of a film director and cameraman “on set.” There are also 3 souvenir kiosks along the Avenue of Stars, including one dedicated to Jackie Chan merchandise and memorabilia. Nightly, at 8 PM, the promenade is a popular viewing place for the free 14-min. light and sound show called the “Symphony of Lights.” Here, 44 prominent buildings on both sides of Victoria Harbor, part of Hong Kong Island’s famous skyline, becomes spectacularly illuminated. Avenue of the Stars: Tsim Sha Tsui, Kowloon, Hong Kong. How to Get There: by MTR, take the East Tsim Sha Tsui MTR Station, exit J, near InterContinental Hotel. It is a 3-min. walk from the avenue. Tsim Sha Tsui MTR Station, which is linked by pedestrian subway to East Tsim Sha Tsui MTR Station and has common exits is also within walking distance. The Tsim Sha Tsui Star Ferry Pier is also a 10-min. walk from the avenue. Follow the promenade past the clock tower and along the harbor side, in front of Hong Kong Cultural Centre and Museum of Art. The Star Ferry Bus Terminus, located at Star Ferry Pier, is the terminus for KMB services 1, 1A, 2, 5, 5A, 5C, 6, 6A, 7, 8 and 9. Routes A21, 8A, 13X, 26, 28, 35A, 41A, 81C, 87D, 98D, 110, 203, 208, 215X, 219X and 224X all stop on Salisbury Road, outside New World Centre, a 5-min. walk from the avenue. 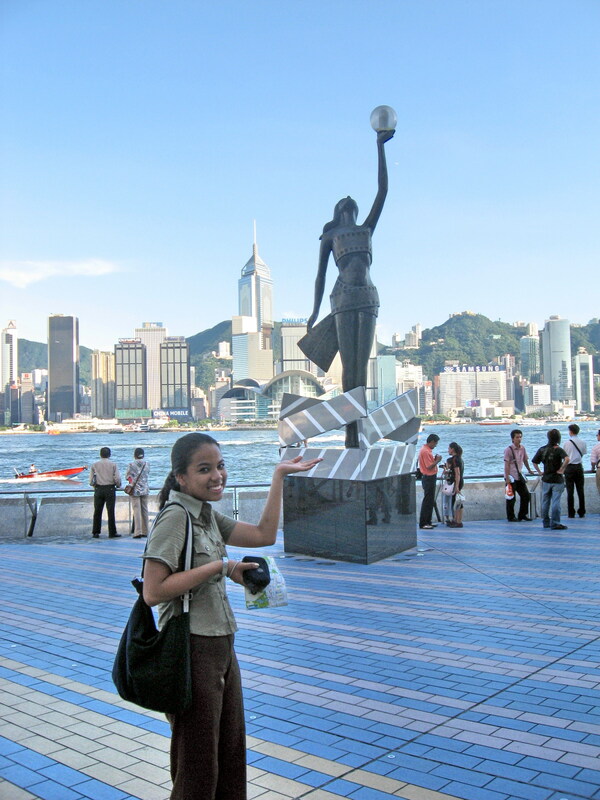 This entry was posted in Hong Kong, Sightseeing by Benjie Layug. Bookmark the permalink.